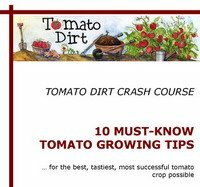 Tomato Dirt introduces Tomato Masters … a friendly competition among tomato gardeners as we cheer each other on to tomato-growing success. Tomato gardeners are a sociable and supportive bunch. We like seeing others’ gardens and produce. It’s fun to share with each other, learn from each other, and admire each others’ tomatoes. So why not encourage each other and cheer each other along, especially if along the way some of us get to brag about our successes? Tomato Masters is a competition but it's also about sharing and inspiration. We admit it: we’re making this up as we go! It’s true. 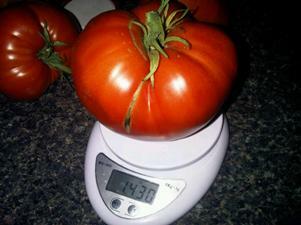 Size is not everything, especially when it comes to tomatoes. But to be honest, when it comes to awarding Bragging Rights we have to start somewhere. Weight is a logical place. It’s a measurable parameter. So here’s the dirt. Our first series of Tomato Masters Bragging Rights will go to the gardener who sends us documentation of largest tomato, by weight. Email us a photo of your tomato, its recorded weight, and its variety. (Hop on over to our Contact page to send us an email. You can paste the photo in the email.) Take photos with the tomato positioned on a scale to show weight. Please post your photos on our Facebook page in addition to emailing us a copy. Other gardeners want to see what you’re growing! Note: posting on Facebook does not constitute entry. You can enter one tomato per variety per contest month. Winners may re-enter in successive months, but you must enter a different tomato variety. For instance, if you win June Bragging Rights with a Giant Belgium, you may enter again in July but only with a different variety. If you do not win during a specific month, you may reenter any variety. We will post entries on our Pinterest page on a unique board so you can view them in one place. Entries must be submitted by midnight on the last day of the month in order to be considered for Bragging Rights during that month. The competition is based on the honor system. But gardeners are a notoriously honest bunch. Winners will be awarded a Tomato Masters Bragging Rights certificate and will be featured on the Tomato Dirt Bragging Rights page. Thank you for your enthusiasm and for sharing your tomato successes with other gardeners! We look forward to seeing your tomatoes and being inspired.